The Premier cuts the ribbon to inaugurate the three shows at the BIECC. The trio of trade shows – popularly known as ‘3Gs’ – comprising the gulfBID, gulfInteriors and the Gulf Property Show concluded last month (May 12 to 15) in Bahrain, with organisers, exhibitors and visitors hailing them as a success. A plethora of new products were launched and deals struck at the biggest integrated business-to-business platform for the construction, interior and property sectors in the Northern Gulf, which was held under the patronage of the Prime Minister of Bahrain HRH Prince Khalifa bin Salman Al Khalifa. 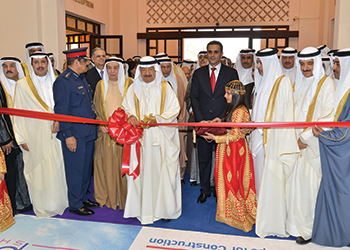 The event was held at the Bahrain International Exhibition and Convention Centre (BIECC). Organised by Bahrain-based Hilal Conferences and Exhibitions, the event attracted more than 7,200 visitors, and featured over 130 companies representing segments as diverse as construction design, engineering, project management, construction plant and machinery, green buildings, residential and commercial real estate assets and related services and home-grown and international brands representing sectors such as furniture, paints, kitchens, bathrooms, lighting, ceramics, wall coverings and art and accessories. gulfBID 2015 enjoyed strategic sponsorship from Haji Hassan Group, a third-time exhibitor, which showcased products and services from its portfolio of 15 divisions and joint venture partners, including Bahrain Precast Concrete, Bahrain Blocks, Haji Hassan Ready-mix, Arabian Chemical Industries (Isola), Haji Hassan Reinforcement, Arabian Parts Company and Bahrain Pipes (see Contractors). KMC Holding, the owner and manager of turnkey solution companies across the Middle East, was also a strategic sponsor of gulfBID as well as gulfInteriors. “There was a good visitor turnout and we had serious meetings with interested prospects. It was a good branding exercise too,” a spokesman for KMC Holding said. KMC, which has a portfolio of over $3 billion in the region, used gulfBID to formally handover a $5.85-million project to its client. “At the show, we marked the successful completion of three warehouses for Al Mazaya Holding at Bahrain Investment Wharf,” said Adnaan KhoKhar, cost control manager of KMC. The Gulf Property Show was in its third successive year and featured developers not only from the GCC but as far afield as Turkey, the UAE, Bulgaria, Malaysia, and the UK, with additional real estate opportunities being exhibited from Cyprus, Bosnia, the US and Spain. Plafixx Dry Mix Company of Bahrain made its debut at gulfInteriors where it displayed a wide range of high-quality plasters and mortars manufactured by its Saudi-based associate Wuensch Plaster Company. “We are a newcomer on the market and gulfInteriors offered us an opportunity to create awareness in the region of our products and showcase our services,” said assistant sales manager Sajan R.
Leading steel scaffolding and formwork manufacturer Manar Al Omran launched its new Profex and Profemax systems at gulfBID. The lightweight Profex formwork system is suitable for shear walls, lift shafts and stair wells and boasts high durability and cost effectiveness while the heavy-duty Profemax is designed for thicker shear walls. Profemax will be used in the construction of the Riyadh Metro stations as well as for the walls of Kingdom Tower in Jeddah along with the Manar Cuplok system for the slabs, said Ahmed Hassan, marketing manager. He claimed that the company has grabbed the lion’s share of the projects in Bahrain with its systems being used for the construction of Treasure Tower in Dilmunia, Nest, the 42-storey Forbes Tower in Sanabis, two towers in Durrat Marina, Dadabhai’s Juffair Heights, as well as the Avenues Mall being built opposite the Bahrain World Trade Centre, to name a few. Buoyed by the ‘good’ response it got last year at the fair, Berger Paints launched two new paint collections this season. R Raghu, senior manager – sales and marketing, said the company launched its entire Weathercoat exterior products and Royale Crystalle luxury emulsion. “Both the products were well accepted and received a good response from the visitors,” he said. He said the company is working on some key projects such as the Ministry of Housing’s (MOH) public private partnership (PPP) and strategic projects as well as some private projects. Japanese firm Fujitec held the Gulf launch of its Zexia lift through its Bahrain agent GGLS (Gulf General Lift Systems). Zexia cages can accommodate weights of 450 to 1,350 kg and shaft sizes have been reduced by 250 to 500 mm. The machine room is the smallest in the market at 1,700 (width), 1,900 (depth) and 2,200 (height) mm. Thomas said that later this year an advanced version of Zexia featuring a room-less machine will be launched. German firm Sortimo launched its Globelyst M solution, which comprises an ideal combination of steel, aluminium and composite fibre materials to produce shelves, racks, drawers, trays, boxes, floor panels, metal cases, work benches and restraint poles to store instruments, equipment, tools and other material in a safe, convenient and orderly manner in vehicles. The company operates in Bahrain through the umbrella of Motorcity. The US firm Humanscale held its Northern Gulf launch of Ergo Work Station, which includes a table, a chair, the monitor arm, keyboard and task light. The most important innovation within the unit is the table that can rise with the push of a button, allowing the user to rise and work on his computer. “The benefit of the innovation is that the human body needs to change its posture and position at intervals for proper blood circulation. Earlier adjustable tables were electrical or hydraulic, this is purely mechanical,” said Sami Yousef, Humanscale’s manager for the Middle East and North Africa. Humanscale’s products are supplied in Bahrain through KMC. Hempel introduced its new Strata innovation, which made its Gulf debut at the exhibition. Strata is described as a high-quality multi-layered paint giving the ultimate protection for concrete floors. The name recalls tough rock layers of the Earth’s crust. Hempel also unveiled protective paint Casa Badeya, which was launched a few months ago in Saudi Arabia. The paint has long-lasting properties and is appropriately named after the Arabic word for everlasting heritage. Next year’s shows are scheduled to be held from April 26 to 28.